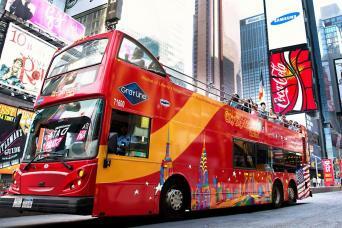 See New York City’s iconic attractions YOUR way, with our 72-hour hop-on hop-off sightseeing bus tour! With our FreeStyle Pass, get even closer and gain access to three New York City attractions of your choice! 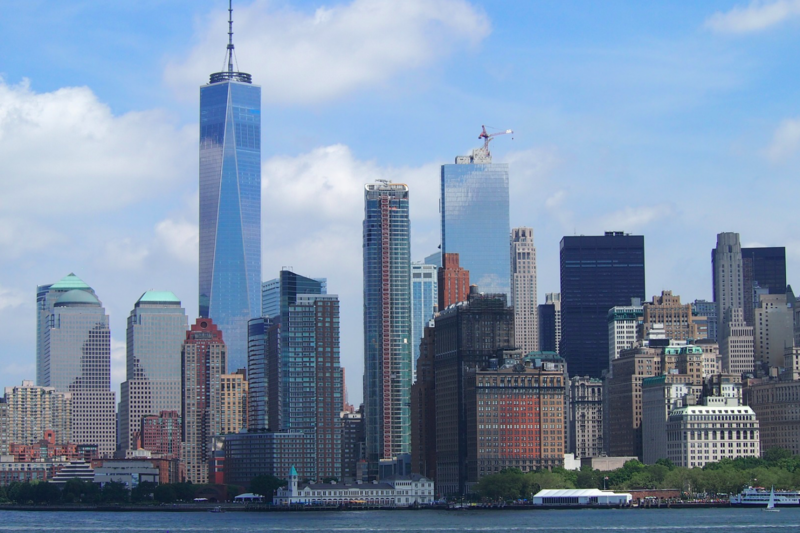 Choose from some of the city’s major sites such as: Empire State Building Observatory, Statue of Liberty Ferry and Ellis Island, One World Observatory and the Guggenheim Museum, there’s something for everyone! Ticket price also includes a FREE night bus tour! See iconic New York attractions: Statue of Liberty, One World Trade Center, Times Square and much, much more. FREE night tour of New York City. 2-3 hour duration per loop. Gain access to three of New York City’s iconic attractions of your choice! This is the perfect way to see New York your way and plan your own tailored itinerary. You’ll also be able to see all of the other major sights from the top deck of our double decker buses, or hop-off and get even closer on foot! 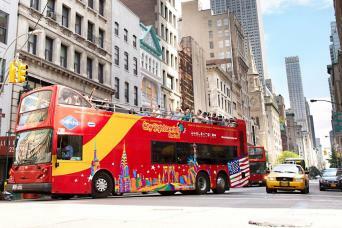 Enjoy this sightseeing bus tour of New York (including Downtown, Uptown and Brooklyn) with unlimited hop-on hop-off access to our double-decker buses for three days! The only pass that includes All Around Town Bus Tour featuring tours of Downtown, Uptown, and Brooklyn. Our All Around Town Tour is the ultimate way to experience New York City at an unbeatable price! • Choose admission to 3 attractions of your choice. Unlimited hop-on, hop-off access at prime locations in Manhattan, and Brooklyn for 72-hours. FREE Night Tour of the city lights at iconic attractions included. Ferry Tour of New York’s famous waterways, featuring views of the Statue of Liberty and Ellis Island included! The only pass that includes All-Around Town Bus Tour featuring tours of Downtown, Uptown, Brooklyn. Choose from 40 available attractions including: Empire State Building, Statue of Liberty, Top of the Rock, and Madame Tussaud’s. Additional options include Go Airlink airport shuttle, for convenient transportation to your airport. Our Freestyle Pass® New York offers flexibility, convenience, iconic sightseeing and entry into some of the coolest NYC attractions! Now, you’ll even have the option to visit the Statue of Liberty and Ellis Island with your pass!You’ll have full access to all 4 hop-on, hop-off bus loops through Uptown, Downtown, and Brooklyn. Sit back and enjoy stunning views as our professional guides point out world-famous landmarks, including Times Square, the Empire State Building, Madison Square Garden, Rockefeller Center, the Brooklyn Bridge, and the Statue of Liberty! In all, you’ll see 40 top attractions and learn the background of New York’s neighborhoods.Hop off the bus at any of the conveniently located stops along the tour to explore a sight up close, spending as much time as you’d like browsing award-winning museums, strolling in Central Park, or dining in Chinatown – to name just a few of your endless options! When you’re ready to continue the tour, simply hop back on the next bus! Your Pass also includes admission to three top attractions of your choice! Just select a 3-attraction pass and choose from our list of the city’s most popular attractions. Ripley's Believe It or Not** (Includes LaserRace) Now included in FreeStyle Pass® Pick 5! Matches will sell-out; availability on first-come, first served basis. Redemption for tickets can be made at Ticket Customer Service located directly to the right of Gate 4. 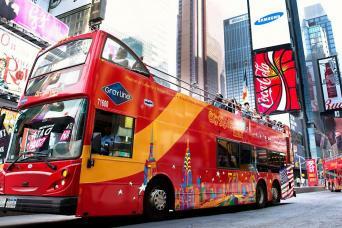 Make sure to mention the New York Sightseeing FreeStyle Pass®. Blackout Dates: August 6th, 2017. • New York Mets games at Citi Field: Monday - Thursday ONLY. Redeemable at Citi Field Box Office beginning two (2) hours prior to game time. Go Airlink Airport Shuttle Share Ride (For departure transfers only. Reservations required. Guests must call 877 599-8200 to reserve) Now included in FreeStyle ® Pick 7!